About a year ago, I invited the British writer, artist, and University of Oxford doctoral researcher Tamarin Norwood to contribute a web-based work to ICA’s exhibition ICA@50 (2014). As part of the museum’s anniversary celebrations, fifty projects—including eighteen artist commissions—responded to historical ICA exhibitions in order to investigate the museum’s past and help propel it into the future. 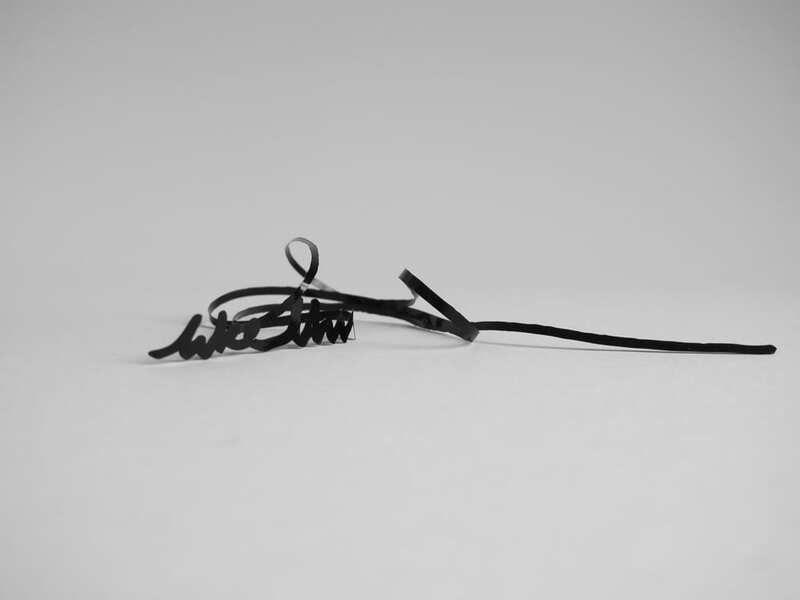 Norwood makes her objects, events, and texts—which I first encountered online—with specific attention to the context of their reception (transatlantic time zones, digital and physical spaces), and deftly translates between mediums (British Sign Language gestures into delicate wire forms; writing into drawing). I felt she would work skillfully with the multiple contexts and mediums at play in this commission: ICA’s relaunched website, the museum’s archive, a historical exhibition with four decades of discourse around it, and Norwood’s own practice. Norwood, who has recently completed commissions for the Liverpool Biennial, Tate Britain, and Modern Art Oxford, worked with digitized archival materials from ICA’s 1973 Agnes Martin retrospective to produce A Fine Line (2014), a suite of four short digital videos that play with relationships between surface and line. She was inspired by the ways in which Martin’s alternate layers of graphite and wash complicate ground and mark dynamics. The project, ICA’s first web-based commission, quickly attracted more than a thousand online visitors. In this interview, we discussed Norwood’s interest in lines and surfaces, her views on the digital vs. analogue debate (specifically, questioning binary distinctions between “digital” and “analogue” materials, processes, and forms of communication), and why studio art counts as a legitimate form of research. Becky Huff Hunter: Tell me about your interest in lines. Tamarin Norwood: The Fine Line videos began with an interest in the form of the line as a representational device. The line can be a graphic element in a diagram or drawing or stretch of writing, in which case it exists as a material form on the page but apologetically so: really it means to be transparent, as though the page were a pane of clear glass looking onto whatever the image or text is meant to represent. Historically this aspiration toward transparency has provoked a great deal of play in representational drawing and writing. You can draw or write in such a way that the eye is forced to focus on the surface of the glass instead of looking through it, so that anything being represented is secondary to the virtuosity of the lines themselves—a sparkling metaphor or rhyme for instance, or a quavering mark that speaks more to the gesture that produced it than the object it was produced to represent, if it represents anything at all. Self-apparent literature, metafiction, and certain abstract and expressionist practices are examples of this kind of play, though I think it runs through all representation as a critical undercurrent. The converse is also true. Thread, wire, a beam of light—these are all linear forms that exist as opaquely nonrepresentational material, but their opacity can provoke a similar play or agitation. They can be seen in terms of the material properties that determine their practical use, but those properties can also be read for what they might represent, like seeing pictures in clouds. I saw some wire drawings by Gego at the Henry Moore Institute (Leeds, UK) the other week. Very often what looks like a pencil drawing turns out to be a skein of manipulated wire hanging in the air against a white backdrop. A couple of these drawings were made from wires crimped and crinkled from some previous use, perhaps in electrical equipment, and in this context the originally incidental crinkles acquired a new aesthetic or pictorial value, without altogether forgetting their origin in the bare function of the material. I see A Fine Line as part of this play or agitation of the line. Shot from a certain perspective and with particular lighting, the lead of the retractable pencil resembles a line even as it produces other lines. 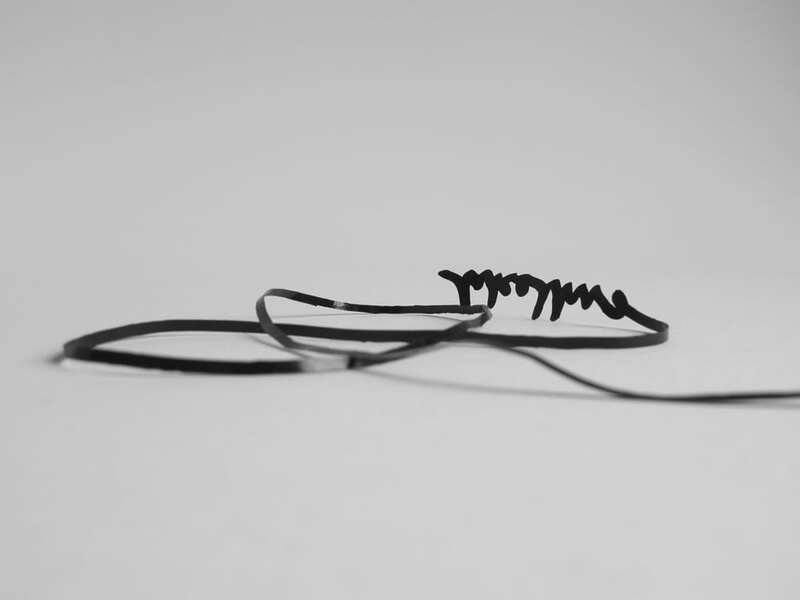 Working with the time-based medium of video and with digitally generated forms allowed me to develop this visual ambiguity further—incorporating the black line that marks a split screen for instance—and think more about the relation of the screen to the camera lens, to the sheet of paper, and even to the surface of the video while it’s being edited and is still pliant. BHH: It sounds as though you’re thinking of the computer screen, the lens, the editing software, and the paper as having something in common through all functioning as supports for the work, rather than making binary distinctions between them as analogue and digital. Do you agree and, if so, could you expand on those thoughts? TN: That’s right. The paper, the computer screen, the camera lens, and the pliant surface of the video-in-production all share the quality of being grounds for the figures they support. You could count the pane of glass I mentioned earlier as another of these grounds. Each is a ground in a different way—for instance the lens isn’t strictly a ground at all—but nevertheless I find it productive to imagine what they might all have in common. As a set of relationships emerges between the line of the pencil lead, the graphite lines it leaves on the paper, the digitally generated lines, and the split-screen lines, it’s compelling to imagine a parallel set of relationships between the grounds—the worlds or terrains inhabited by each species of line. The play between each line and its ground reveals something new about drawing and figuration. Little discoveries are made on each terrain; by lifting them from one terrain and testing them against another, there can be a compounding of new insights into drawing, figuration, figure, and ground. Does the hand-drawn line relate to the digitally generated line in the same way that the page relates to the computer screen, or is it different? Can we say the same for the pencil lead and the carefully angled camera lens? What can we make of the angle of the lens, and how does it relate to the angle at which I view the raw video footage as I sit at the computer editing? These elusive commonalities strike me as more productive than the distinction between analogue and digital, though of course this is also a feature of the landscape. TN: I like to clutter my studio with finished and unfinished artworks and materials, things that remind me of ongoing plans and ideas, but often those things are videos, texts, and ephemera that can’t be propped against the studio wall. I prop them against the walls of a blog instead. A self-contained commentary (like a blog, though it doesn’t need to be) can serve to capture the hand movements that don’t stay on the page as marks: you might write about the retracted approaches, the false starts, the erasing or amending of mistakes. You might film the process, photograph interim stages, and collect related images and preparatory sketches. These images and gestures build up into a clutter of ongoing research that contributes to future work as much as it recontextualizes completed work. It makes sense to me that the platform I use to document my finished artwork should also document the interim research that continues to inflect it. In the a-n article I pointed out that many artists’ blogs document both the making of artwork and the surrounding practicalities that make it possible to do the work—writing funding applications, sourcing materials, traveling to the studio and back each day, and so on. I asked how one chooses what counts as relevant to the blog or to the practice. My PhD blog is tightly restricted to the making of artwork, but because the work develops at surface level, feeling its way along the ground rather than with a wide aerial perspective, I can’t say at any given moment what does and doesn’t count as part of this work. As a result, though it tightly weaves around a single point, the PhD blog turns out to be expansive, with notes and references that might turn out to be relevant later on; studio experiments that are photographed, filmed, and written up; and occasionally scraps I put online as part of conversations I’m having with curators, collaborators, and other practitioners. BHH: Can you elaborate on the role the blog plays in developing conversations with these individuals? TN: That’s a possibility that opens up when there are so many scraps and sketches accumulating online. The Agnes Martin screenshots that I tacked together into a video are a case in point: it’s an experiment I did while working out ideas for the Fine Line videos, and since our conversation was so closely tied to those ideas I posted it online for you to see. It worked its way into our dialogue like any other remark. The video [above] isn’t a self-contained or finished artwork, but it’s made from the material of artwork, or it speaks the language of artwork. The Waving video is another example of this use of the blog, although it happens to be sufficiently concise and self-contained that I do think of it as an artwork in its own right. I put it online to show Márton Koppány, a Hungarian visual poet I was collaborating with at the time. Although it didn’t form part of my final collaboration with Koppány, it subsequently found its way into my conversation with you about Martin, and finally into the ICA micro-exhibition as an addendum. The way this scrap of video has migrated across conversations and contexts is typical of the way the blog has begun to contribute actively to my research process. BHH: Having already traveled from blog to museum, this “scrap of video” has migrated again, this time to the Art Journal website: an academic context, if a somewhat experimental one. Here, Waving invites viewers to consider carefully constructed visual media as contributing to critical discourse on contemporary art, just as text-based essays and interviews do. Related to this, you’re currently working on a practice-led PhD in fine art. What made you choose an academic context for your work at present? How might art practice be a form of research? TN: There’s a lot of talk about art practice as research these days. In the UK at least, this is connected to a rise in practice-led PhDs, and the interest in explaining how an artist’s work can be understood in an academic context so that art departments can be assessed for the impact of their research on a par with other university departments. This means art practice needs to be described in language familiar to the academy, including making the case that practice can be research. An artist working at a university can adopt quite an activist stance about the status of art as research within the academy. This isn’t an immediate interest of mine. My decision to undertake a PhD has been fairly pragmatic: it provides me with time and financial support to focus on a single research project for three years, and it’s introduced me to new artists, art practices, and conversations about art that I wouldn’t have encountered otherwise. Most importantly, it presses me to identify and grip hold of a single strand of my artwork, and then follow that strand at close quarters to examine where it’s going. My practice tends to proliferate in multiple directions at once, so it makes a difference to pursue one particular aspect of it through a macro lens, so to speak. But the proliferation still goes on at this level of magnification: the thread I’m following has hairs and splits and knots that I can’t anticipate before I’m already upon them. It makes for a research process that is open-ended and open to occasional reorientation. In a PhD context the value of this methodological openness needs continually testing against the value of closing in on a singular aspect of the practice. Regardless of context, academic or otherwise, it seems simple to me that studio practice is research. There are things you can find out or invent in a studio that can’t be discovered or created any other way, and some can only exist as specific arrangements of material form. These are artworks. If we think of research as a process of generating new insight, then both the process of art-making and the process of thought initiated by the finished artwork are part of this generation. Becky Huff Hunter is an art writer, researcher, and digital media professional based in Philadelphia who publishes frequently on internet-based practices. She is a contributing editor of Art Papers and a contributing writer for Sculpture, Art in America online, and Artforum.com. In her current role at the Institute of Contemporary Art (ICA), University of Pennsylvania, Hunter manages digital communications and organizes artist projects for the web. Tamarin Norwood is a British artist and writer. Recent UK commissions include Tate Britain, Art on the Underground, Modern Art Oxford, and the London Word Festival; international exhibitions include MOCCA Toronto, ICA Philadelphia, Beton7 Athens, and AC Institute New York. Norwood’s art writing and fiction has been recently published by by the ICA, Live Art Development Agency, and Bloodaxe. olololo, Norwood’s latest artist book, was published by Modern Art Oxford with Book Works Studio in 2012. Norwood studied linguistics and medieval Italian literature before training as an artist at Central Saint Martins and Goldsmiths, and is now completing a practice-led doctorate in Fine Art as an Oxford University Clarendon Scholar.